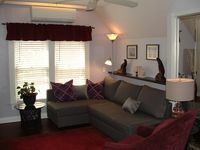 Property 9: Well appointed private guest suite in the S Broadway area, minutes to downtown. Property 13: Gorgeous spotless modern 2 bed, 2 bath flat, sea views, local pubs, great walks. Property 17: Downtown:KING size bed! Huge hot tub. Close to town Elec.car charger! Property 37: Scottsdale Kierland home w/Pool, 3 Bdrs, 2 Baths, modern and ready for you! Property 41: SPECIAL RATES! Southern Pool with Spa, Privacy Fence, Star Wars Themed! Property 44: Charming Half-Duplex with a Lovely Ocean View Steps from Royston Seaside Park! Property 46: Paradise in Pataua, beach front bach with it all ! Property 47: Luxury cottage in beautiful Dartmoor village.